The following are my notes of reading JVM specifications. Data Areas for each individual thread include program counter register, JVM Stack, and Native Method Stack. They are all created when a new thread is created. Program Counter Register is used to control each execution of each thread. JVM Stack contains frames which is demonstrated in the diagram below. 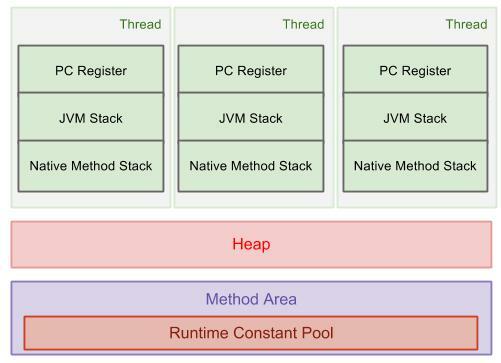 Native Method Stack is used to support native methods, i.e., non-Java language methods. All threads share Heap and Method Area. Heap is the area that we most frequently deal with. It stores arrays and objects, created when JVM starts up. Garbage Collection works in this area. Method Area stores run-time constant pool, field and method data, and methods and constructors code. Runtime Constant Pool is a per-class or per-interface run-time representation of the constant_pool table in a class file. It contains several kinds of constants, ranging from numeric literals known at compile-time to method and field references that must be resolved at run-time. Stack contains Frames, and a frame is pushed to the stack when a method is invoked. 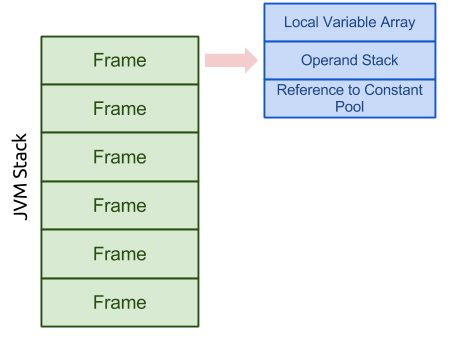 A frame contains local variable array, Operand Stack, Reference to Constant Pool. For more information, please go to the offical JVM specification site. Simple and very expressive. How about incorporating PermGen?